Graphical representation of the Tohoku Earthquake and induced Tsunami. A GPS based early warning system is being developed by NASA and its partner institutes to more accurately predict tsunamis. The system detects the perturbations in the ionosphere due to tsunamis in near real time to provide early warnings to coastal communities. Researchers from NASA Jet Propulsion Laboratory (JPL), California Institute of Technology, and its partner institutes are working on this project funded by NASA’s Earth Science program. When earthquakes and tsunamis occur, they generate acoustic or gravity waves in the atmosphere. In the case of tsunamis, the displacement of the sea surface is transmitted into the atmosphere, where it generates gravity waves in the upward direction. The normal ocean surface displacement has a high frequency oscillation compared to the tsunami waves. As Earth’s atmosphere behaves as an analog low-pass filter, these high frequency waves do not transmit into the atmosphere. Earthquake-generated acoustic waves also propagate in the atmosphere, but the system is less effective in the case of earthquakes, as the time for evacuation is much less than for earthquakes. Instead, real-time monitoring of GPS vertical displacements is used to rapidly detect earthquakes and issue warnings to potentially affected communities within seconds. 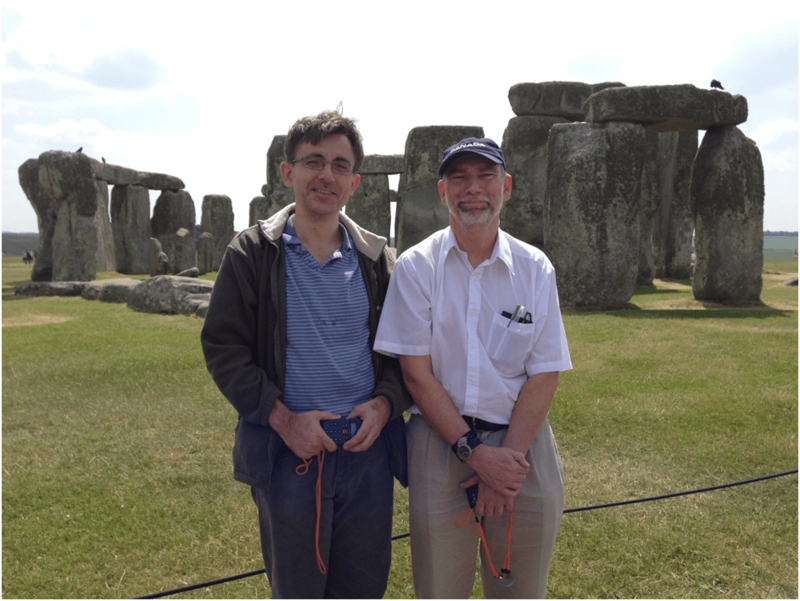 Dr. Attila Komjathy of the Jet Propulsion Laboratory (Left) & Dr. Richard of the University of New Brunswick Langley (Right) (Credits: Dr. Attila Komjathy). Atmospheric disturbances, on the other hand, travel quite quickly. The lower charged or electrically neutral atmosphere is strongly coupled with the ionized plasma making up the ionosphere. Atmospheric disturbances due to gravity and acoustic waves get transmitted to the ionosphere where they generate perturbations in that region’s electron density. These perturbations are visible in GPS data before the actual propagating tsunami waves would impact coastal communties. Ionospheric disturbances generated by tsunamis are co-located with the tsunami, so we can predict the direction and speed and arrival times of the tsunami more efficiently than other technologies by simply monitoring GPS signals. At the time of Tohoku earthquake in 2011, JPL demonstrated that these atmospheric perturbations are detectable using GPS receivers, and that the perturbations are proportional to the tsunami’s magnitude. a global network of GPS receivers (Credits: The Tohoku case study, Earth Planets Space). Early warning sensors such as buoys and tidal gauges are the current state of the art, but these systems are point-based and localized. In many cases, due to the poor distribution of these stations, the identification of a tsunami may only be possible several hours after the seismic event. With respect to the advantage of the GPS-based early warning system over the existing systems, Dr. Komjathy says: “GPS technology is so wide spread, less expensive, and there is so much data that we can retrieve from it, to provide accurate and timely information.” The GPS-based early warning system will not be an exclusive system: the goal is to bring information from all the early warning systems together and use it to increase prediction accuracy and reduce false alarm rates. “This will be an additional piece of information that decision makers can use to give out warnings and prevent potential damage,” says Dr. Komjathy. This month is very significant to the team involved in this project, as it marks the 50th anniversary of the Great Alaskan Earthquake coming up on March 27th. This was the second largest earthquake ever recorded with a magnitude of 9.2, triggering the second largest tsunami with a 70 m wave height when it hit land. It killed 131 people. Researchers at JPL and partner universities and institutes are running simulations to see what would happen if this kind of earthquake happened today, given current technologies available to give out warnings. “We’re planning to have the prototype system ready as early as possible [to meet the anniversary], and it will be enhanced later on to an operational system,” says Dr. Komjathy. The future plan is to demonstrate the prototype, then extend the network globally, especially in the region of the “Ring of Fire,” the area around the Pacific Ocean basin which has major fault lines and where a large number of earthquakes and volcanic eruptions occur.